Delivery companies in Texas are responding to a call for volunteers from the Texas Trucking Association to provide rescue efforts and transport supplies to those affected by the remnants of Hurricane Harvey. Lisa Sursavage, director of communications at Jetco Delivery, and her colleagues were one of several teams hauling rescue supplies across Houston on Aug. 28. Jetco volunteered to help address relief needs in Houston, where the streets are still largely impassable due to Harvey’s wrath. Texas Gov. Greg Abbott also released a call for volunteer services. “If the governor needs help and the people of Houston need help, we always want to be there,” Sursavage said. The morning of Aug. 28, there were 186 pending rescues in the Houston area, according to Sursavage. 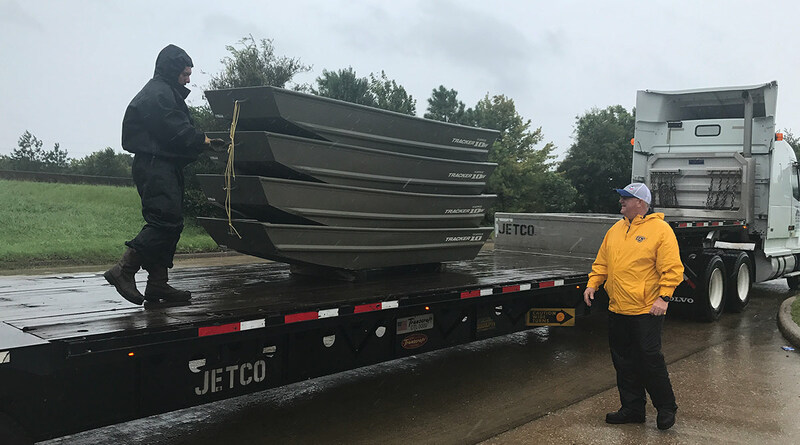 To help with these rescues, Jetco representatives volunteered to drive one of their flatbed trucks laden with seven johnboats, seven motors and a swathe of lifejackets from a boat vendor about 20 miles outside Houston to an outdoor sporting goods store closer to the heart of the city. The U.S. National Guard was waiting for the boats at the destination, Sursavage said. Jetco is one of the companies on Texas Trucking Association President John Esparza’s “rifle-shot” list, which consists of members who are on standby in case they need to deliver supplies. He said he has maintained a list of ready volunteers, in addition to constantly sending alerts and updates to the association’s members. “Anybody who’s not dealing with their own safety concerns locally has definitely been responsive,” Esparza said. In addition to Jetco, UPS and FedEx have dispatched volunteer fleets to make aid deliveries, according to Kathy Fulton, executive director of the American Logistics Aid Network. UPS and FedEx rank first and second, respectively, on the Transport Topics Top 100 list of the largest for-hire carriers in North America. Harvey has pummeled Houston since its landfall Aug. 25. Raquelle Lewis, spokeswoman for the Texas Department of Transportation’s Houston office, said most of the city’s highway system faces intermittent flooding, which has resulted in 306 road closures. Lewis said TxDOT’s chief goal is disseminating information to constituents in the form of news releases and social media posts. TxDOT is supporting Houston Transtar and Drive Texas, two online “living” maps that are regularly updated to reflect closures, flooding and accidents. Inventory crews identify dangerous sites on the road and frequently update the website, Lewis said. Houston’s port closed Aug. 25, and Sursavage said it will remain closed until at least Aug. 29. Approximately 22% of Gulf of Mexico oil production has been shut down as of Aug. 27 because of the hurricane, according to the U.S. Bureau of Safety and Environmental Enforcement. In addition to oil, Sursavage said intermodal work is important for Houston’s industry. The city is home to several major freight routes, including Interstates 10, 45, 69 and 610, Lewis said.